in your world what do you see in me? This video was released 4 years after the demise of Kenny MacLean. I think Mark was still feeling the sting of losing him so suddenly. 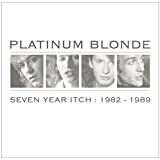 Platinum Blonde's, "It Doesn't Really Matter"
The lyrics of this song refer to the "Troubles" which was the political and social upheaval in England and Northern Ireland which went on from 1968-1998. Lead singer Mark Holmes says that he never intended to make a political statement when he wrote this song but still it's one of Platinum Blonde's most famous, and unintentional, hits. This song is upbeat yes but depressing as hell because of the song being about the "Troubles" in England and Northern Ireland from which Mark's family fled.